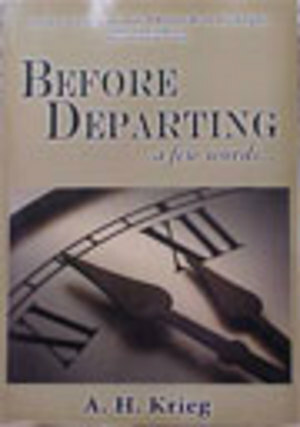 Before Departing a few words, is a compilation of published Essays, letters and articles all stemming from the turn of the 21st century. Written by A. H. Krieg and published in magazines, newspapers, periodicals, as well as on the Internet radio and TV. Among multiple releases are The Barnes Review of History, The Nationalist Times, Culture Wars, as well as several European publications. Topics are wide-ranging from politics, law, science, economics, education, the environment, war, the Middle East, energy, health care and the media, gun control, religion, race, etc. It is an excellent reference book for talk show hosts that have a backbone. Plagiarist students that want to seriously aggravate their sophist academic instructors may use the book.